With the theme this year of “Righteous Among the Nations,” the overflowing marquee of people attending this year’s United Nations International Holocaust Remembrance Day, at Wellington’s rural Makara cemetery, heard many moving references to the Righteous, including a previously untold story of what befell a Dutch family. Members of Parliament, Wellington’s Deputy Mayor, diplomats and interfaith representatives participated in the commemoration. New Zealand’s Holocaust Remembrance Day is co-sponsored by the Holocaust Centre of New Zealand, the NZ National Commission for UNESCO, the NZ Human Rights Commission, and city councils in Wellington, Auckland, Hamilton and Christchurch, with support from local Jewish organisations. A small group of Holocaust survivors laying stones at the Holocaust Memorial in the Jewish Cemetery as the ceremony concluded were accompanied by young children from the capital’s Jewish community. At the Parliamentary reception that followed, hosted by Labour MP Ginny Andersen, speakers included the newly-appointed Chief Human Rights Commissioner, Paul Hunt, and a tribute from Hungarian Holocaust survivor Mary Mowbray to the Righteous Among the Nations person who saved her life. Along the walls of the Great Hall at Parliament, where the reception was held, stood the exhibition “Beyond Duty: Diplomats recognized as Righteous Among the Nations” which has been curated by Yad Vashem and the Israel Ministry of Foreign Affairs. 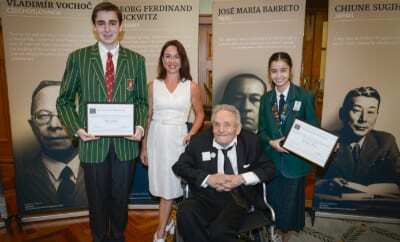 Ninety-year-old Auschwitz survivor Paul Seideman was present to meet the two winners of the competition he has endowed, for secondary school students to write an essay on a Holocaust topic. 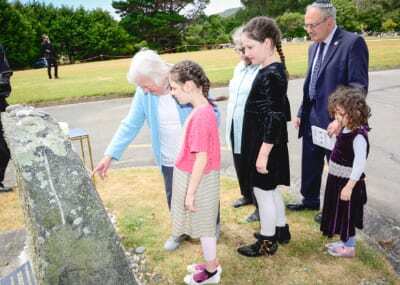 The combination of the Makara Cemetery ceremony with the Parliamentary reception and the focus on the Righteous made the commemoration of Holocaust Remembrance Day a memorable occasion for the Jewish community and Wellington’s public.